came from my Mom and Dad. Their lives began in 1920 and they lived through the Great Depression, WWII, and many more years with little money and a lot of hard work. I remember the church Rummage Sales as treasure troves for the red plastic records which I could play for hours on my small portable turntable and fancy covered old books, pieces of fabric, small vases. Good beginning for a life long quest for thrifted finds to be collected, repurposed, shared. Many of the pieces below are collections given to me from an old friend, mixed in with my own thrifted collections. 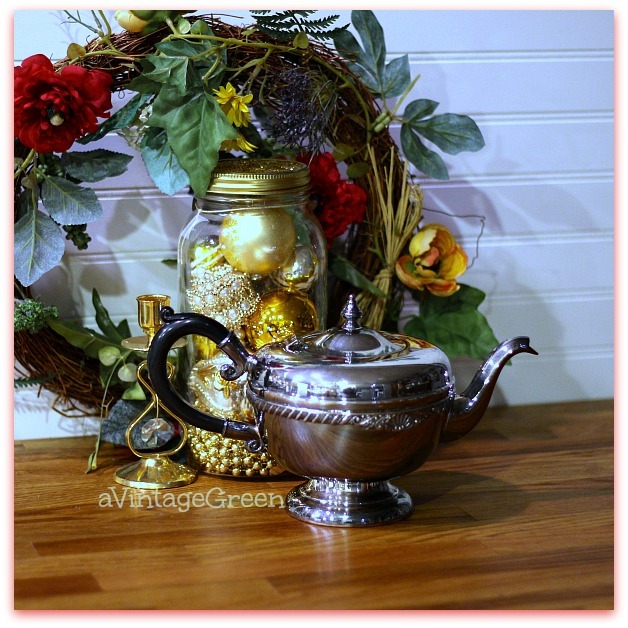 The silver plated teapot was a wonderful shiny grey and it took some time to bring back the silver shine. I used Silvo because I could not find a large and deep enough glass container to use the tin foil/baking soda bath method for shining silver. Thrifted finds. The pieces below did get the tin foil/baking soda bath to bring back their shine. See: Woman in Real Life. The little salt shaker went from the grey silver to bright silver in about a minute. Thrifted finds. 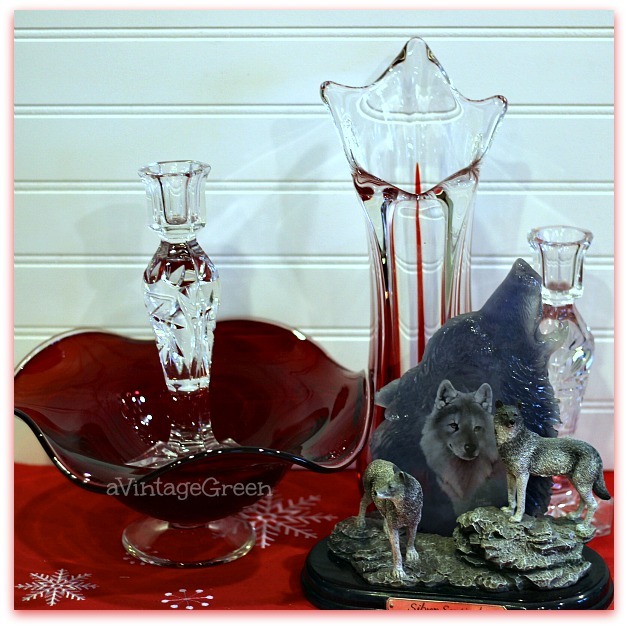 Pinwheel candle sticks, a Wolves sculpture, a bowl and a red/clear vase are bright reminders of the season ahead, my friend's collection. I love the gold and white buttons in a salt shaker nestled in an infinity scarf. 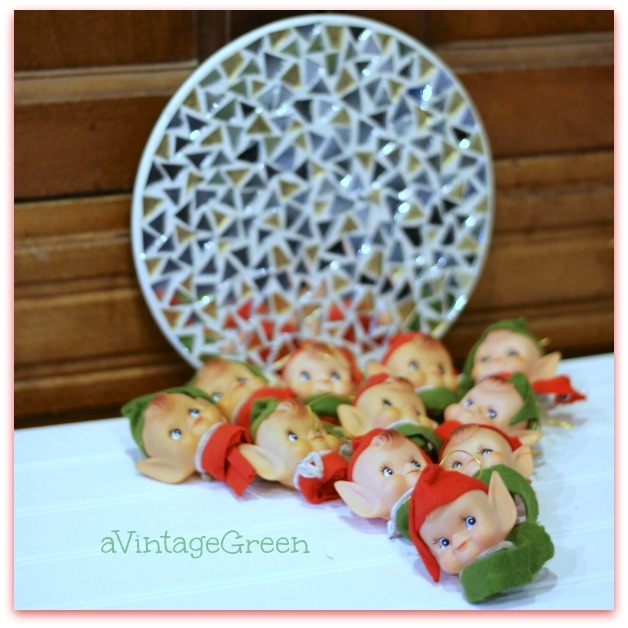 Eddie introduced finding Christmas elves last Christmas. My friends collection. The boots are thrifted finds and the phone/Mickey/candle holders, tea-light and John Deere Cookie jar belonged to my friend. 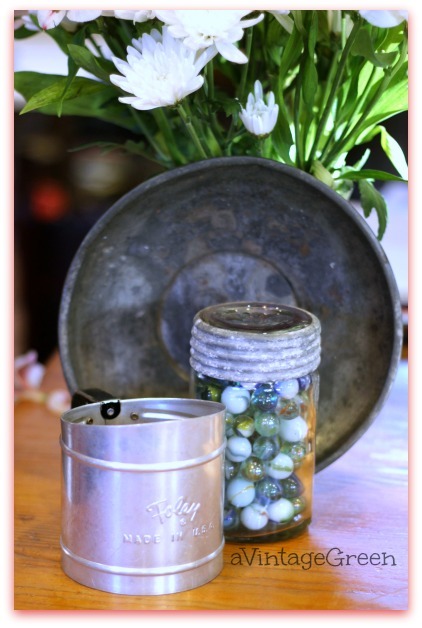 The Foley small sifter, marbles in a vintage sealer and the old pan are mine. I am very fond of old metal. Thrifted finds. 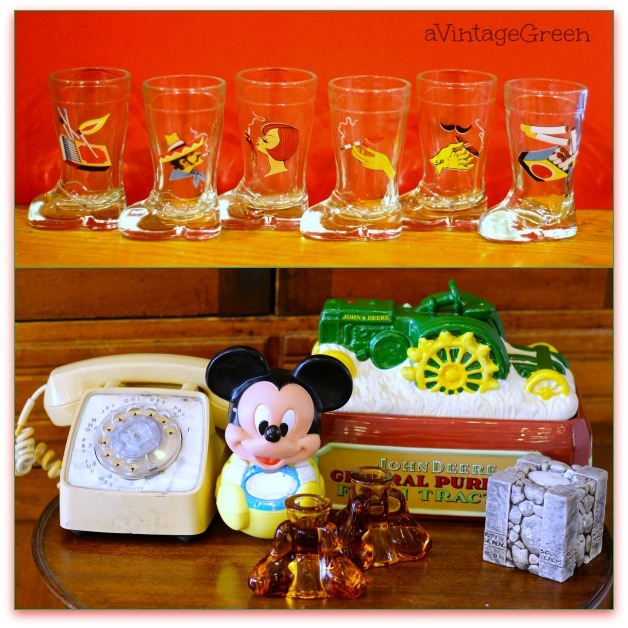 And finally, a collage of this group of collectibles. Need to start Christmas card. Last year care of Dad and packing and finding new homes for his possessions as well as helping with getting his condo ready for sale took all my spare time. This year Dad is gone and I am going to write his last Christmas letter to his friends telling them how his last year was. 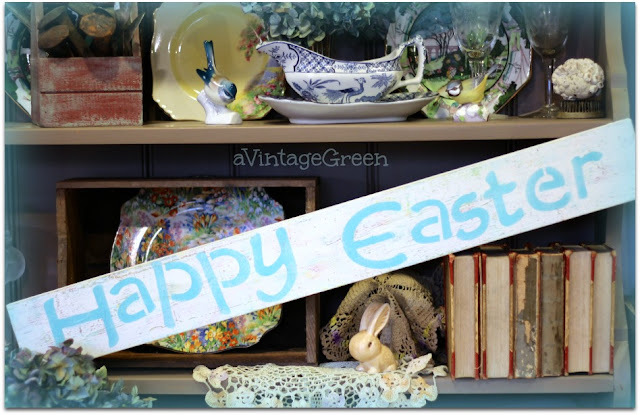 I have great empathy for so many blogging friends this season as they have gone through the addest of times as their spouses or children or elderly parents passed on. Veterans Day (Canada) was a time for remembering. Dad's funeral was held November 6th and Taps was played. He was in the Air Force WWII. It has been a season for remembering. I am so very grateful that Dad was in my life until his 95th year (d. 2015 October 5). For 68 years I could talk to him, love him, hug him, and for the last 15 plus years help him live as he wanted. Remembering Mom (d. March 27, 2015) too, such a hard working and gently soul, dearly loved. I know that life will fill in the time with other caring but right now there seems to be open spaces where tears fall and memories surface. Thanks Joy your post helps me with how I have been feeling. 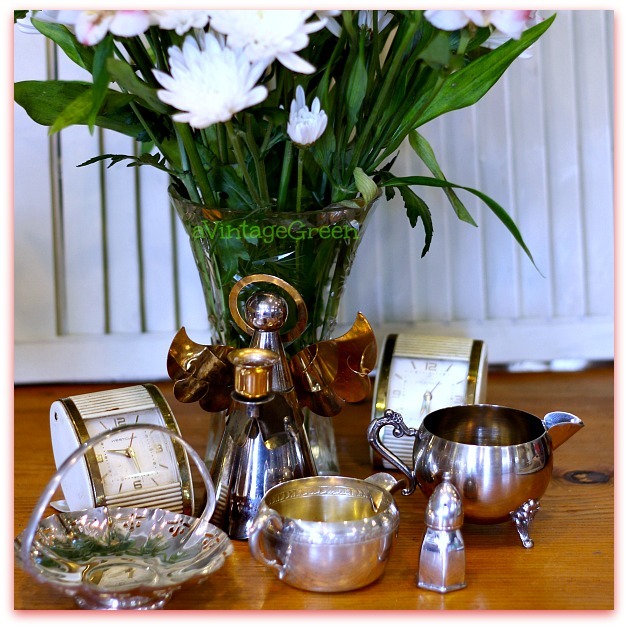 I am new to your blog and love all your silver treasures, brought back to a lovely shine. Sorry to hear your sad family news, I have had some losses too. You are so blessed to have had two good parents! I love hearing you and Rob talk about them. I love thrifting and Goodwills partly because all of our clothes were given to us in large boxes when I was growing up. I guess we didn't have black trash bags back in the 1950's and early 60's. I always love visiting you!! You always find wonderful items while thrifting. I find polishing silver to be relaxing. Hope you have a great week, Joy. 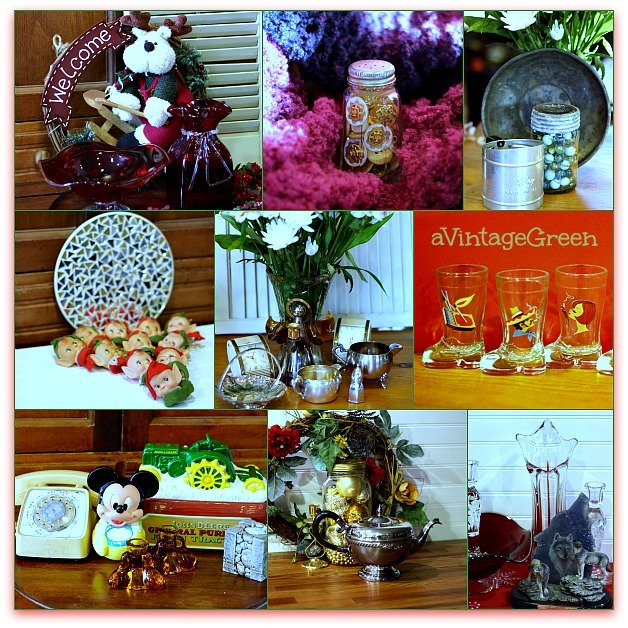 Wonderful vintage treasures and memories. Sorry to hear about your Mom and Dad, so nice to have wonderful memories of loved ones! So sorry about your mom and dad; keep those memories close! Beautiful post Joy. I especially loved this saying "there seems to be open spaces where tears fall and memories surface". Grieving and celebrating life. Glad you have wonderful memories of your parents. Oh, I forgot ... LOVE your header and all these treasures. The blue wolf sculpture is quite unusual. Thanks for sharing. This is a difficult season for you with two huge losses. Your writing is beautiful: "open spaces where tears fall and memories surface. " Have a Happy Thanksgiving and a Happy Blue Monday! about 6 months ago. 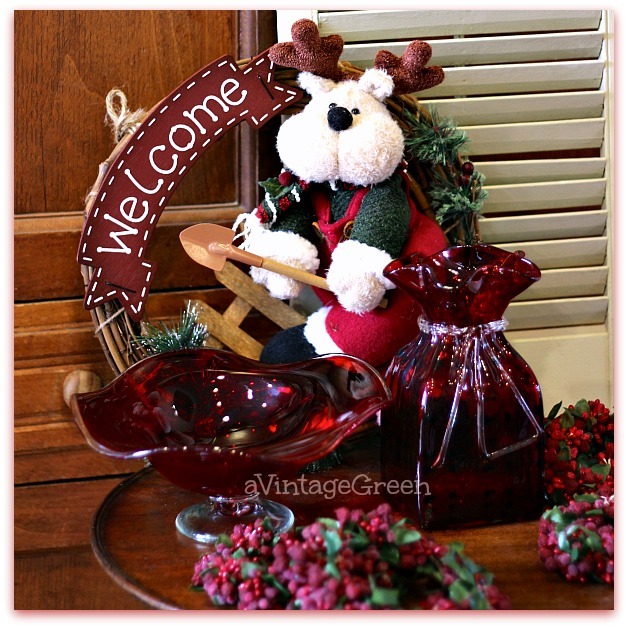 Love all your wonderful finds and the mason jar idea is really cute.